As flaring kites from Gaza continue to burn Israel's south, Agrlcutral Minister Uri Ariel wants vandals shot. 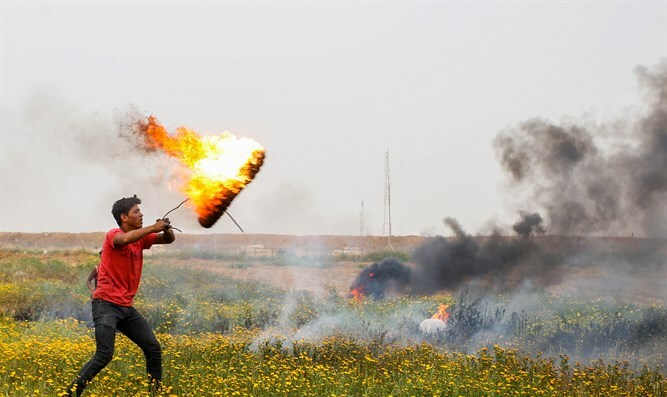 Farmers in Israel's south have been repeatedly victimized by burning kites that are flown in from Gaza in recent weeks. Just on Wednesday, hundreds of dunams in Be'eri were scorched by a blaze resulting from a flaring Gaza kite. The IDF has been helpless to stop the phenomenon and farmers have been suffering immense financial loss. According to Agricultural Minister Uri Ariel, Gazans attempting to fly in burning kites should be shot in order to foster deterrence. "After two or three of them get a bullet in the knees, it will not happen again," Ariel told 103FM. "Shoot in the knees anyone who throws firebombs and burns these wonderful fields, where the real Zionists live," added Ariel. "We cannot let this phenomenon continue, there is no justification for it. It's terrorism like any other form of terrorism." Recognizing the farmers' financial distress, the State of Israel announced earlier this week that it will compensate monetarily the owners of the burned fields. To date, these “firebomb kites” have caused damage of several million shekels.